Harry N. Abrams, 9781419728716, 416pp. "Warner’s distinctive voice and language compel readers to pay attention to this detailed world . . . Brilliant, savage, hilarious, a riveting journey through a harsh world that mirrors our own." "In a brash and wildly inventive novel, Andrews (Me and Earl and the Dying Girl) effectively uses a gonzo alternate reality to frame urgent issues that include income inequality, rampant consumerism, and class disparity. Warner may be small, but his giant heart and brutally honest narration propel this intense, cuttingly funny novel." "It’s not subtle in the way that Gulliver’s Travels, M.T. Anderson’s Feed, and Scott Westerfeld’s “Uglies” series aren’t subtle; it’s social commentary with a bite . . . Endlessly discussable and a first purchase for public and high school libraries." ". . . offers a unique, caustic, thought-provoking lampoon of America’s obsession with wealth." 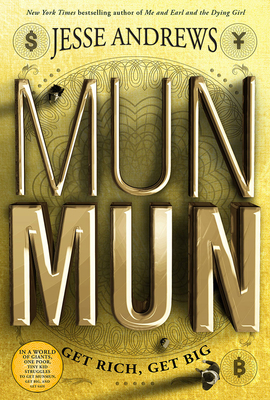 "MunMun takes a swipe at today’s economic and political climate. It parodies the outlandish lifestyles of the supersized superrich contrasted with that of the destitute, tiny ultrapoor." "Be prepared to have your reality turned upside down"